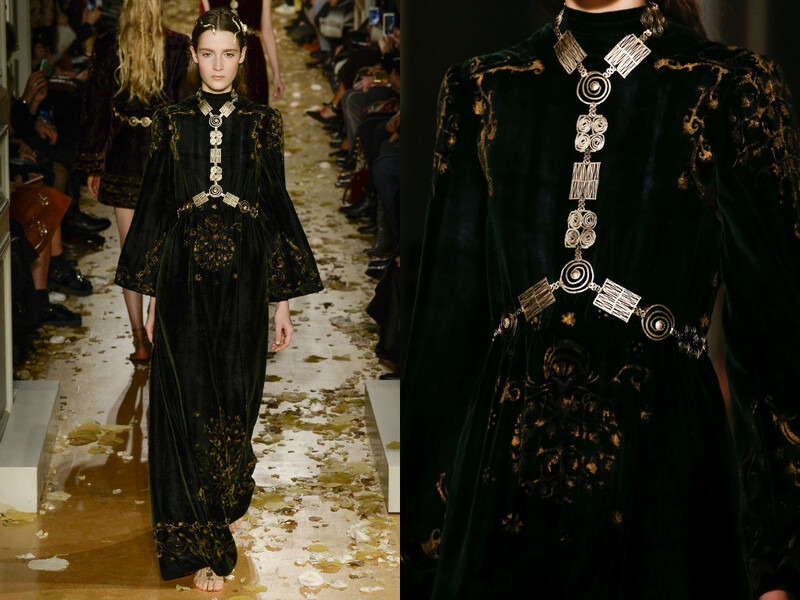 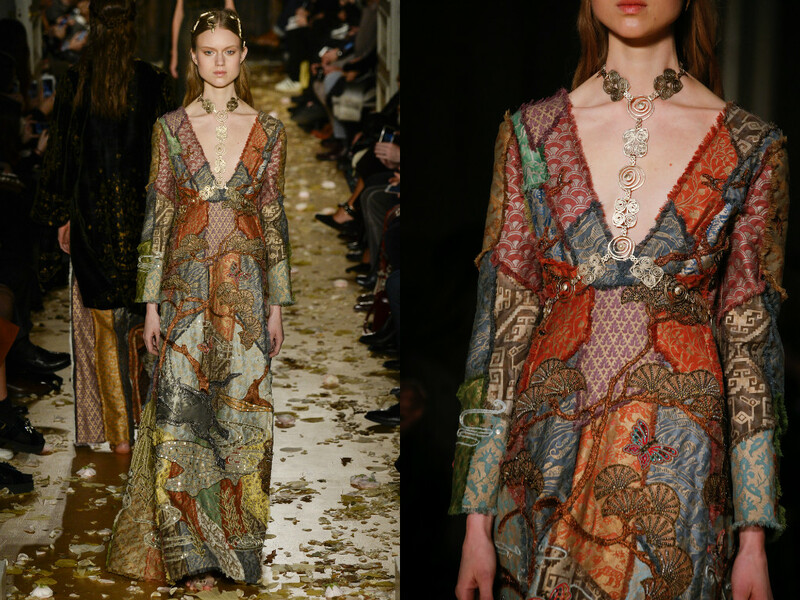 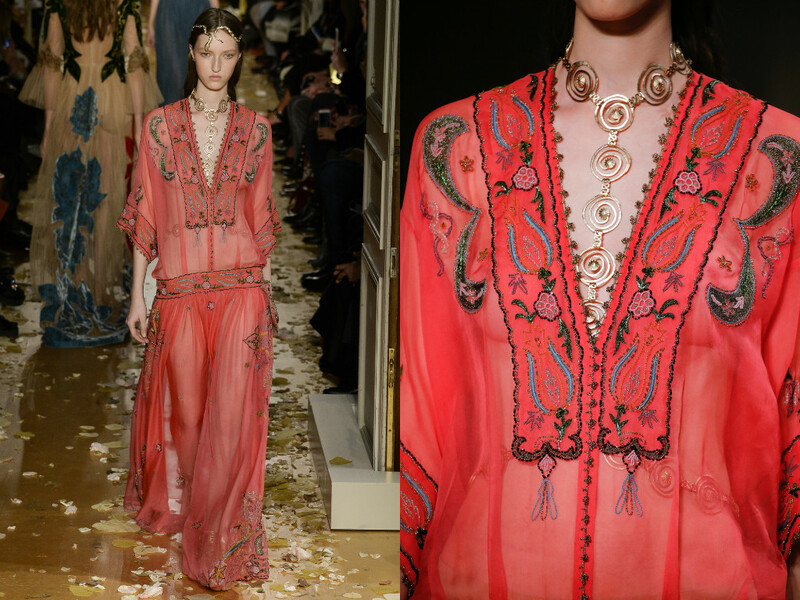 With Valentino, I feel that - especially during recent collections - they have taken us back to another time. 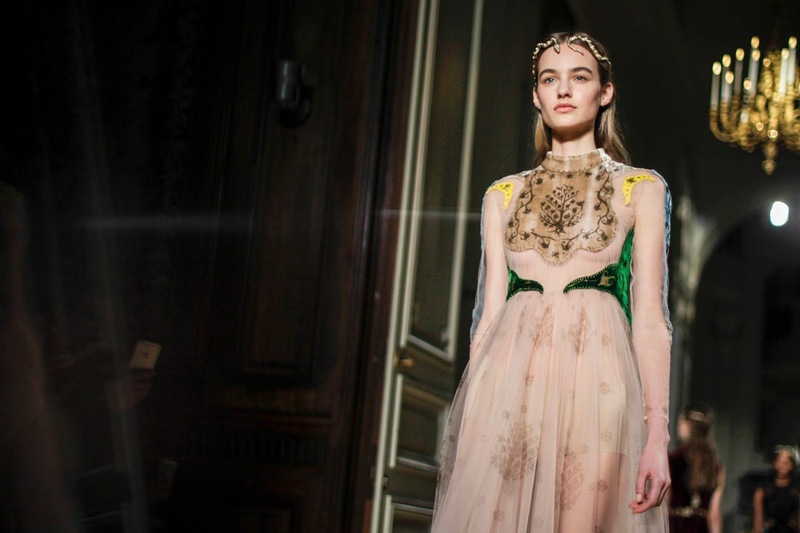 World even. 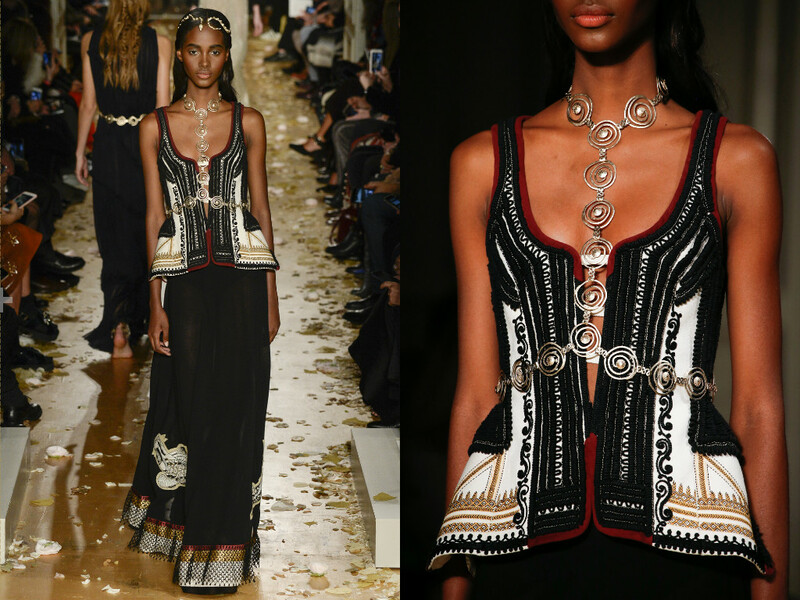 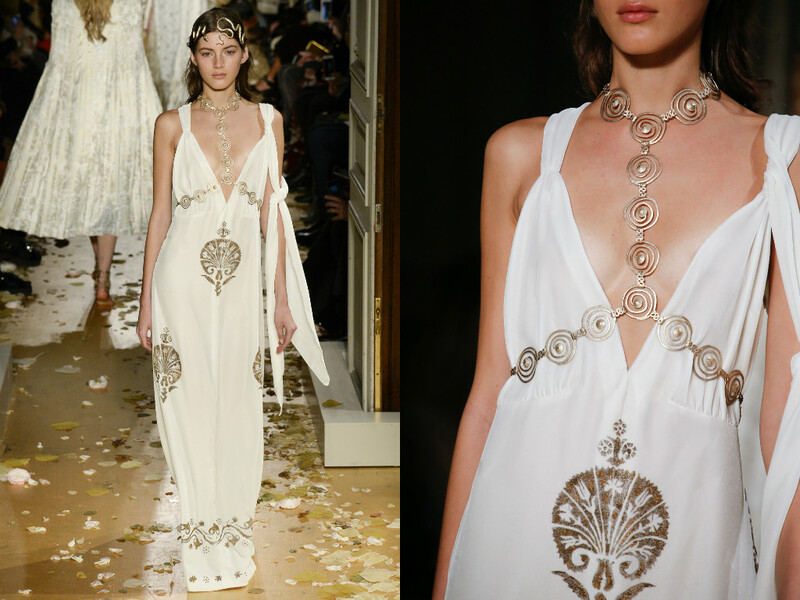 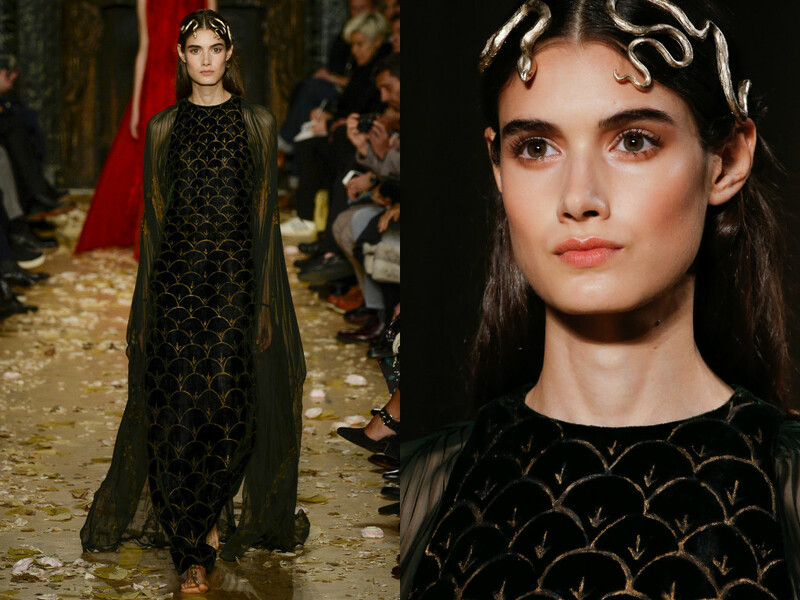 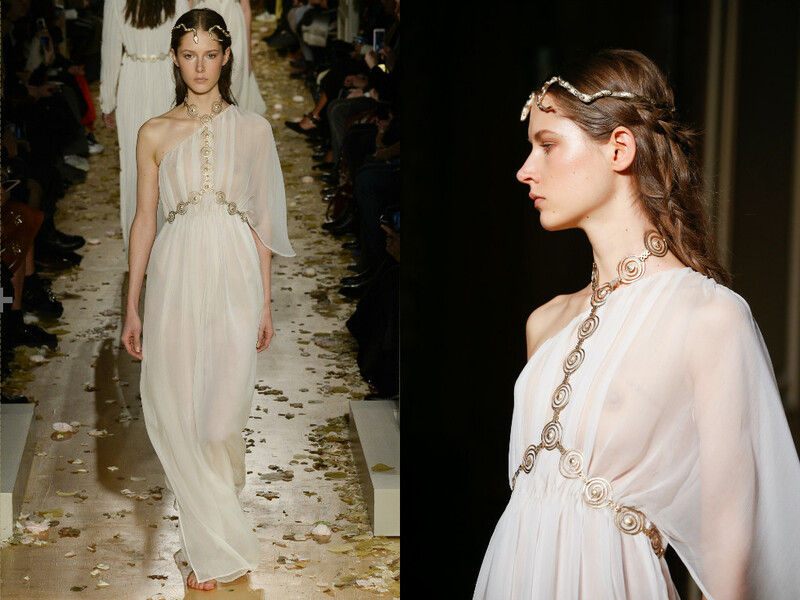 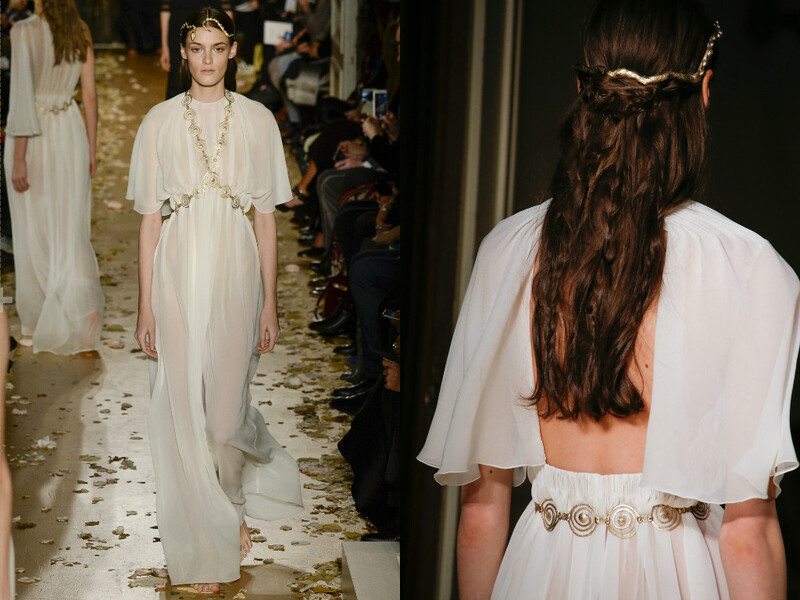 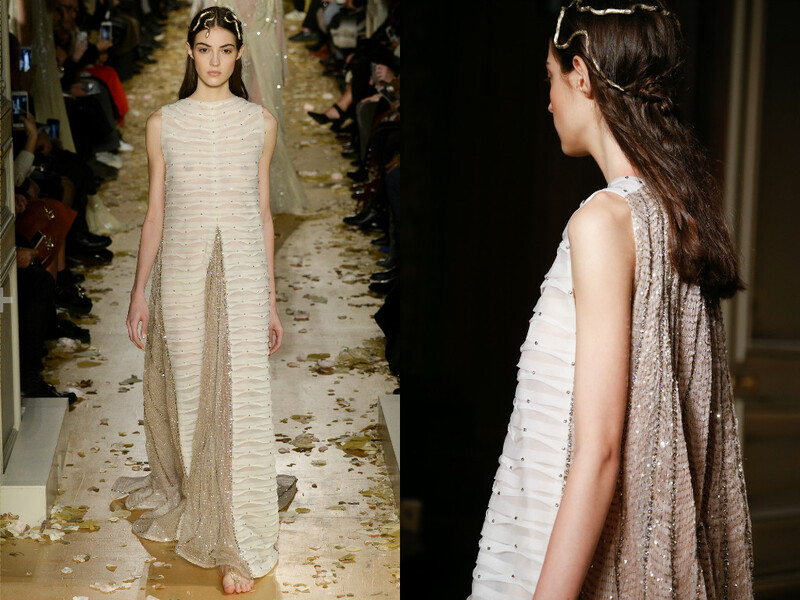 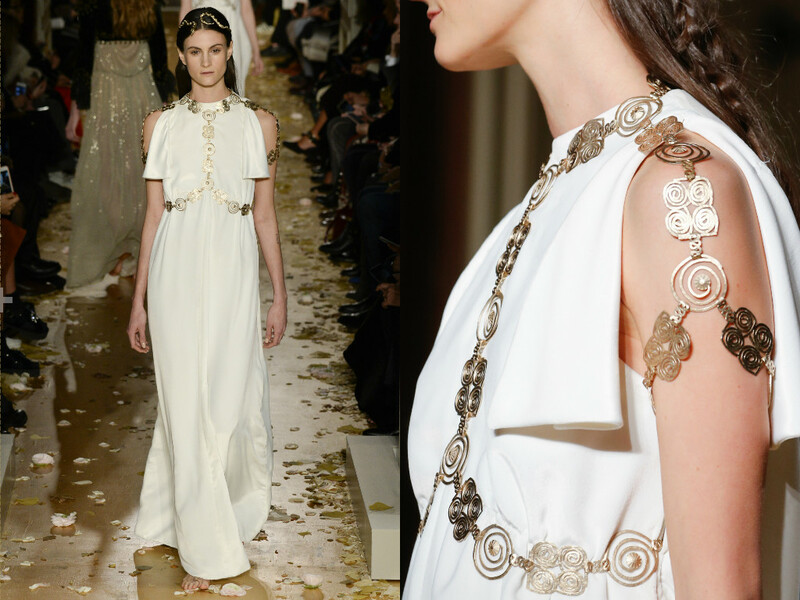 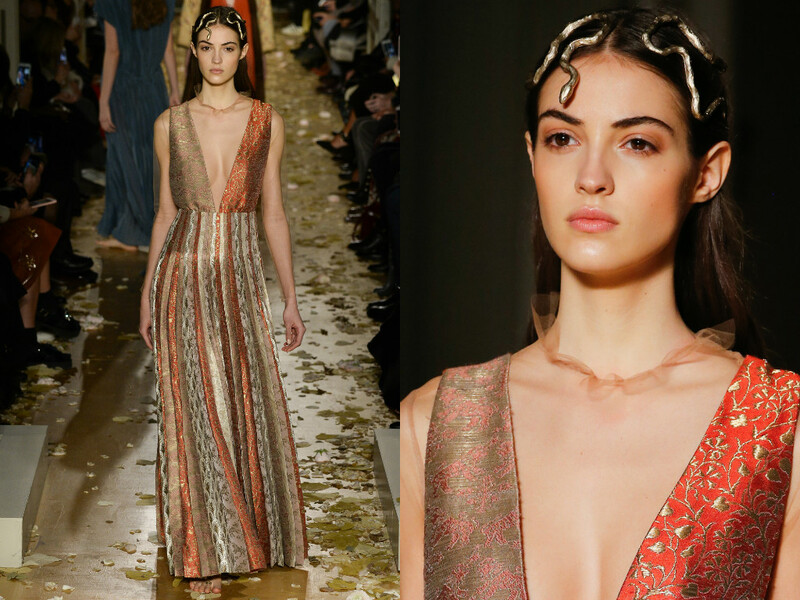 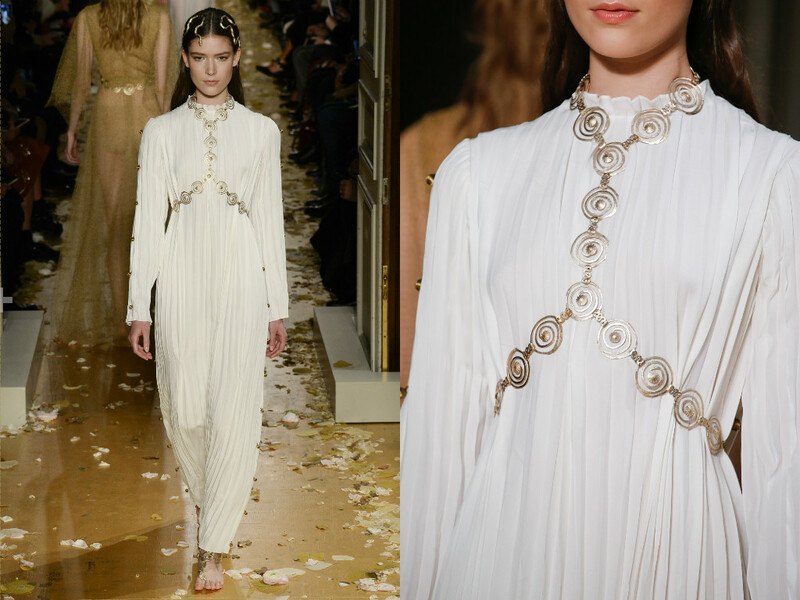 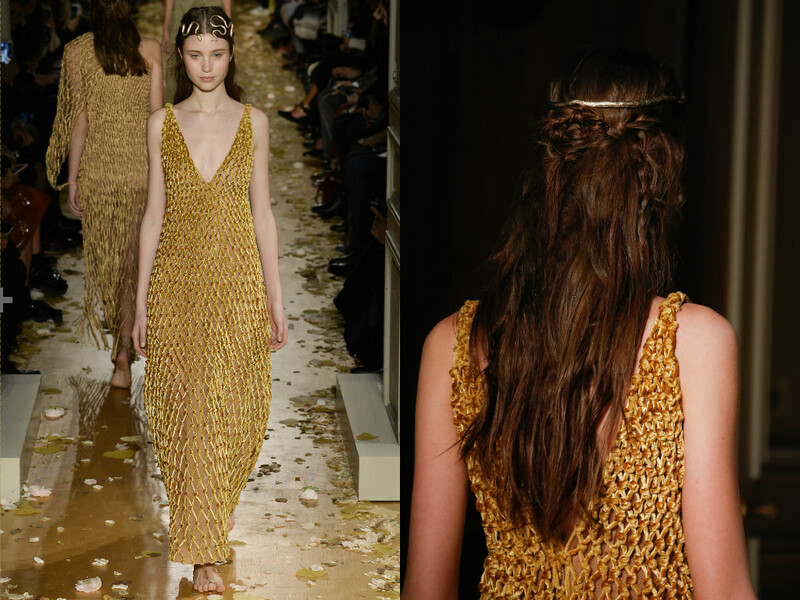 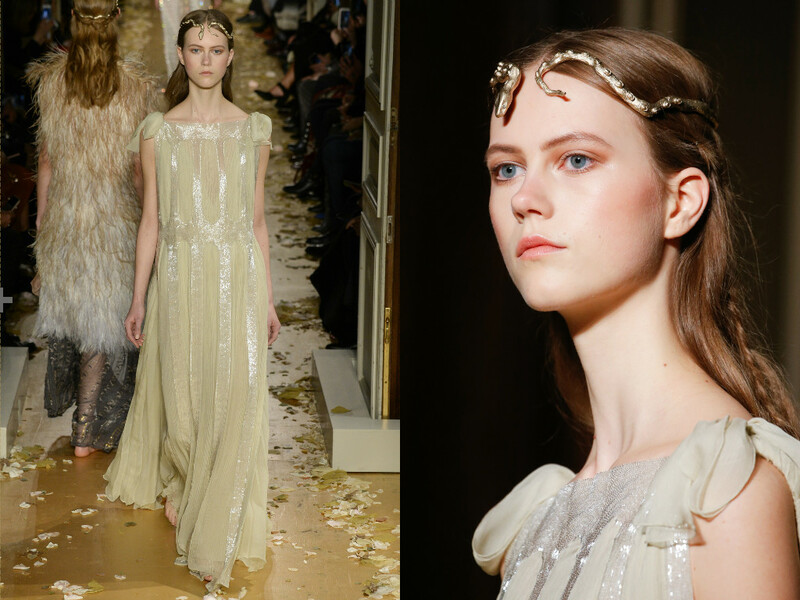 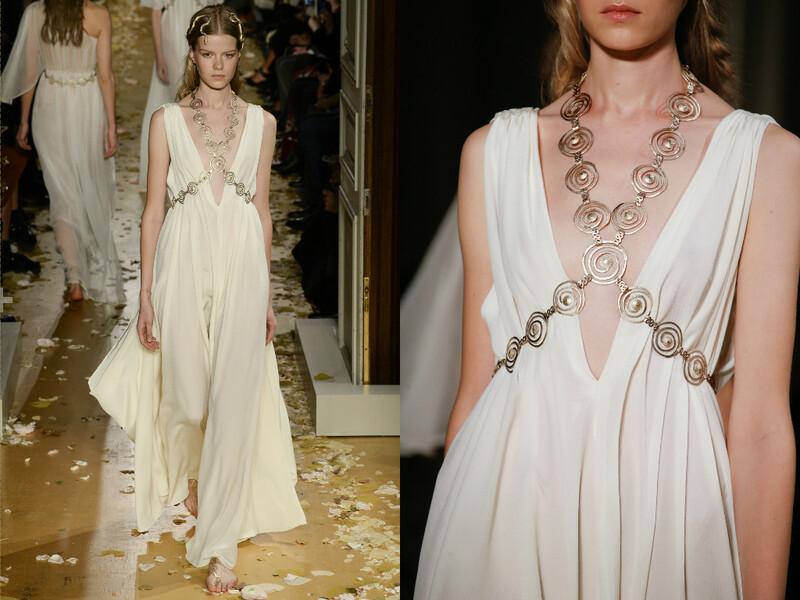 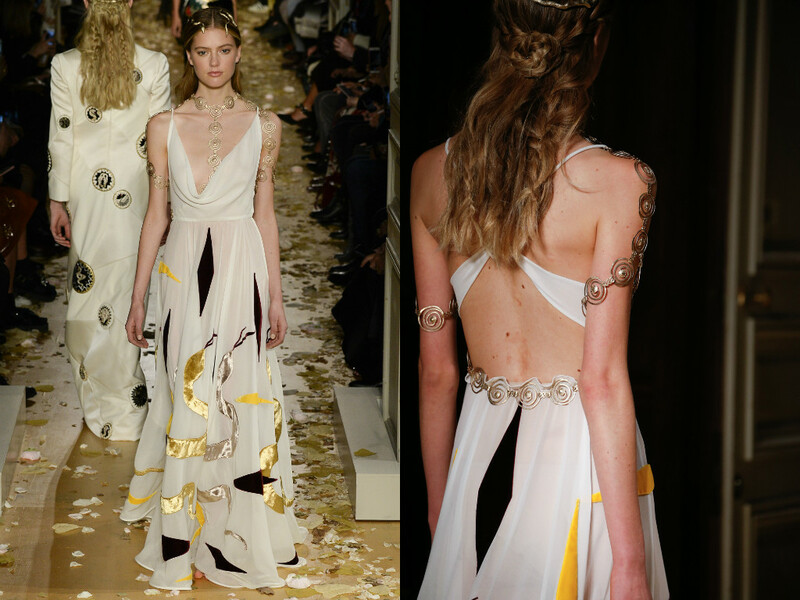 That world being Ancient Rome and proving to us that Valentino can transform any woman into a Roman Goddess. 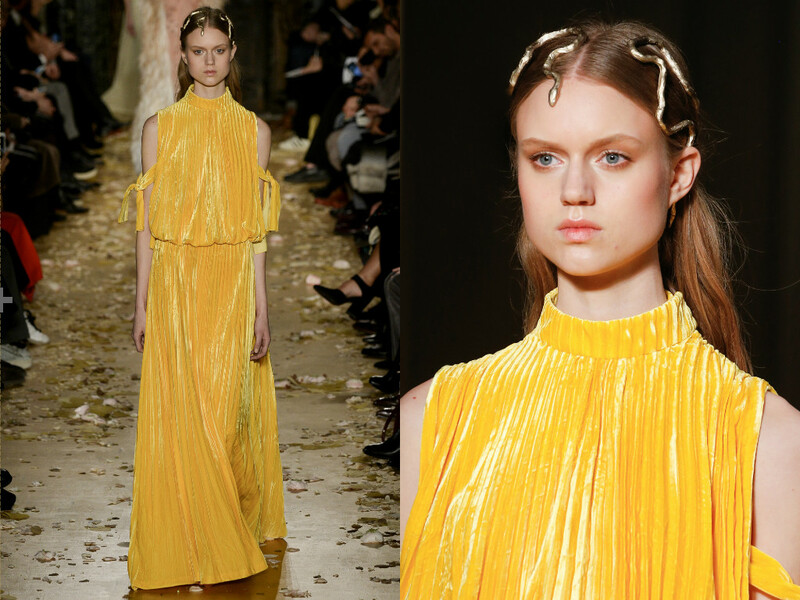 Maria Grazia Chiuri and Pierpaolo Piccioli always have an interesting, and inspiring, way of describing their muses for each collection. 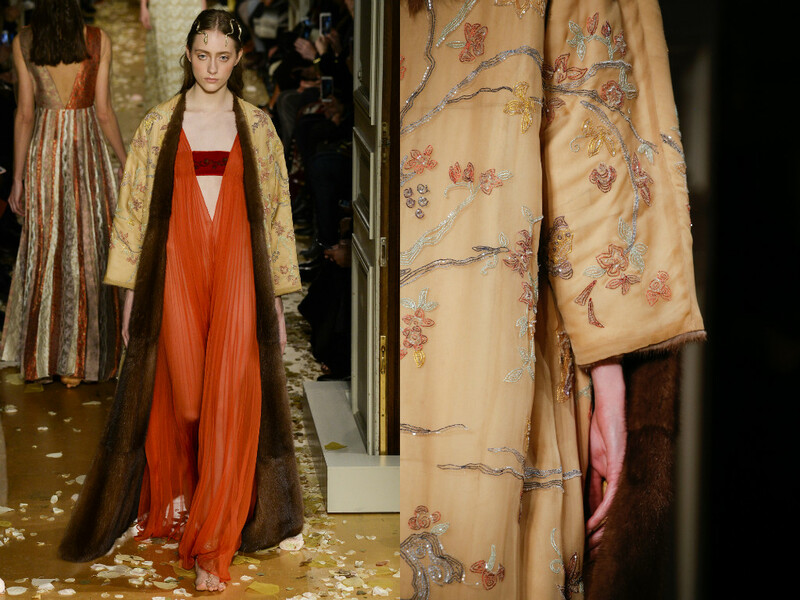 Maria described that Spanish Designer, Mariano Fortuny, was a muse, focusing on his gorgeous dresses he had designed and the beautiful velvet fabrics he had incoporated into his collections. 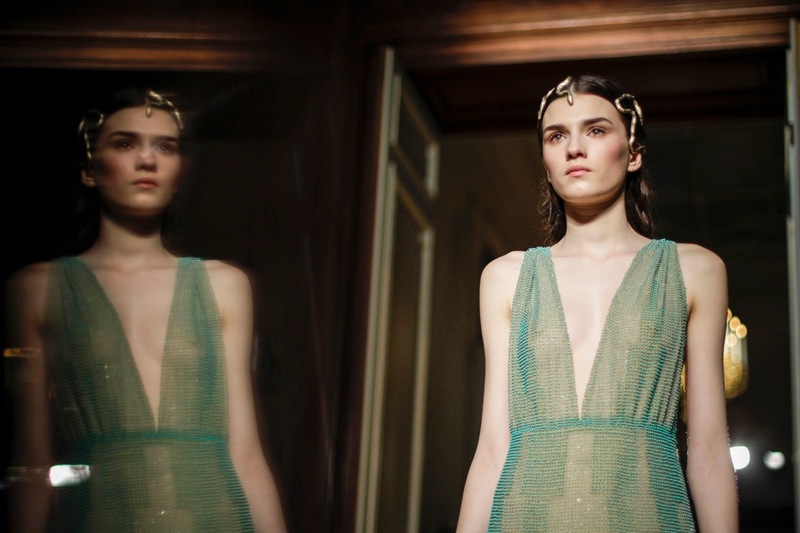 Pierpaolo stated other inspirations, those being the Isadora Duncan and Loie Fuller who were famous dancers, focusing on their "expressionist dancing" as he described. 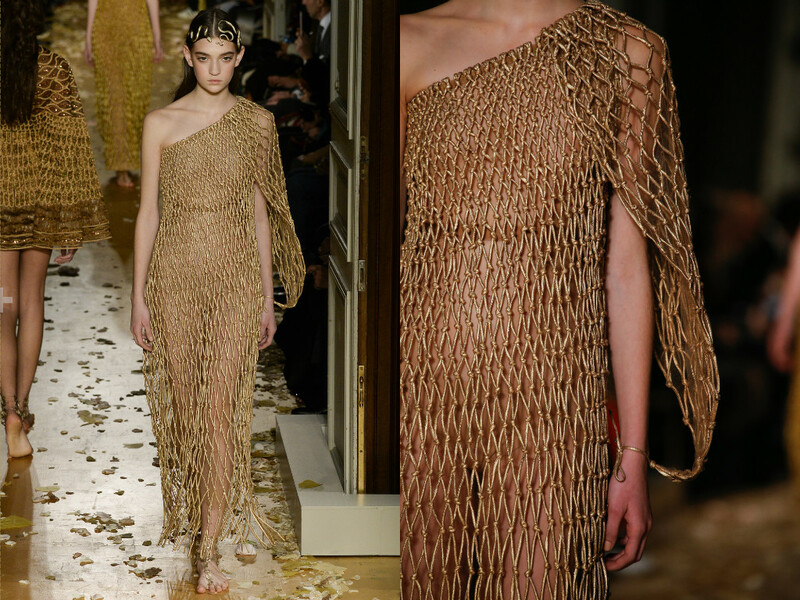 The 'expressionist' part was clear in this couture collection. 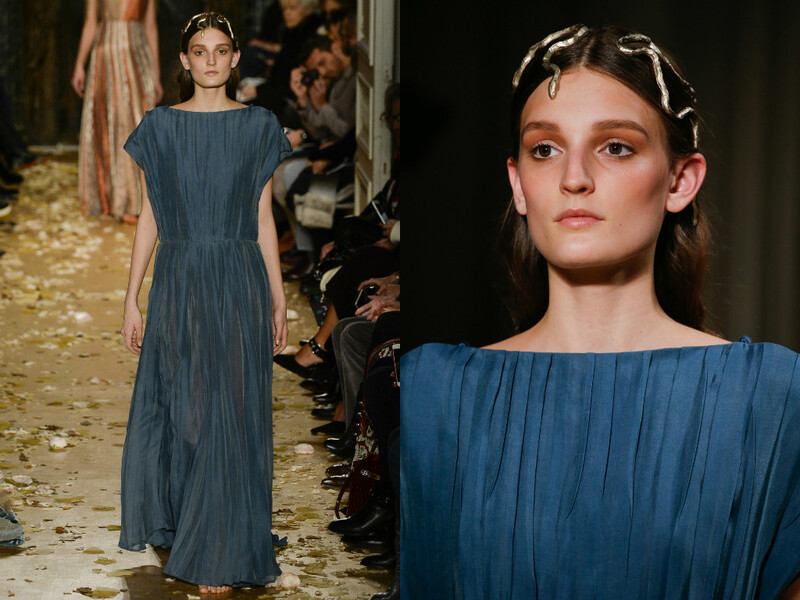 Individuality is a word that the wearer of this mesmerising collection would need, and the inspirations as far as I am concerned are also always so evident when brought to my attention, expressing Maria and Pierpaolo's desire to reflect and remember history. 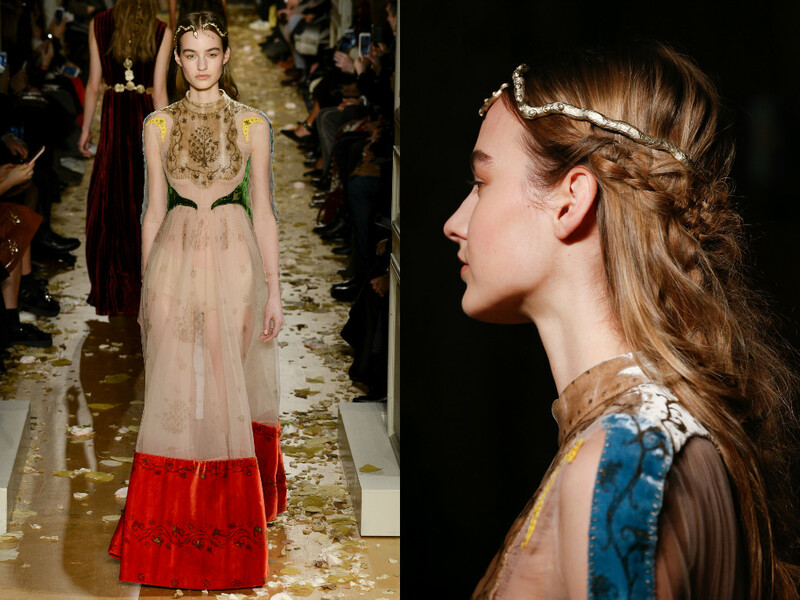 Valentino is the perfect example of fashion not being just clothes, but actually a story and sometimes a remembrance. 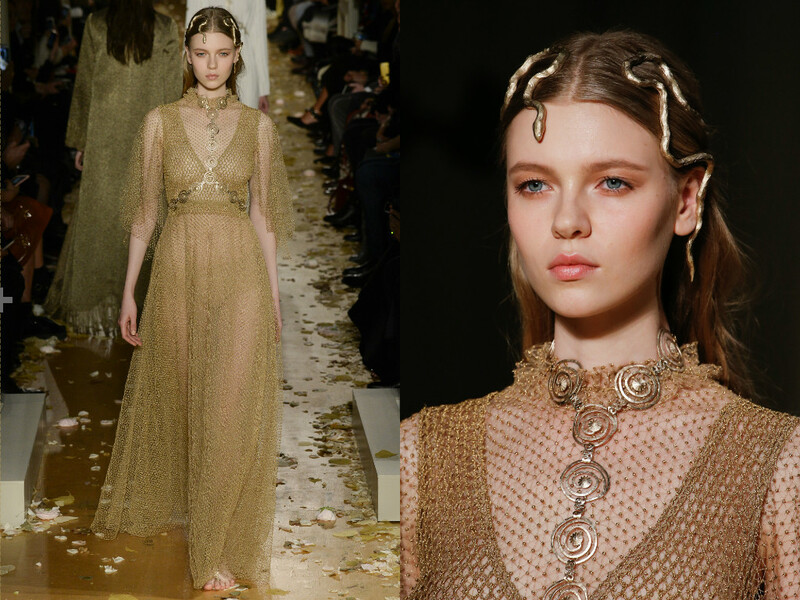 The muses that were described really did infuse gorgeous 20th Century Romanticism alongside the ancient roman vibe I noticed. 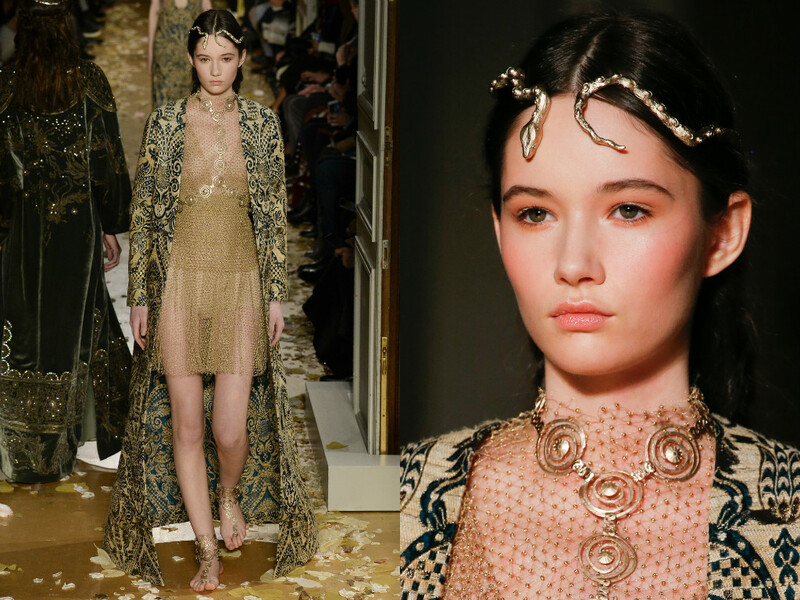 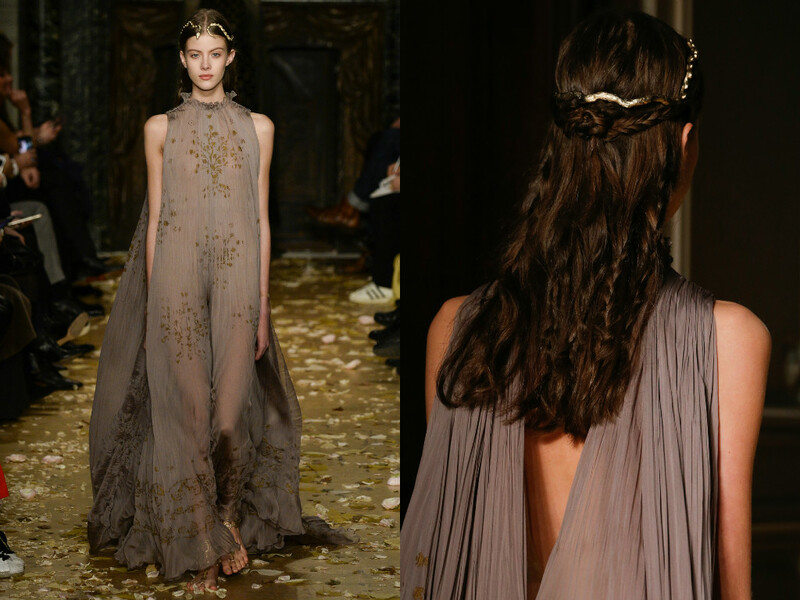 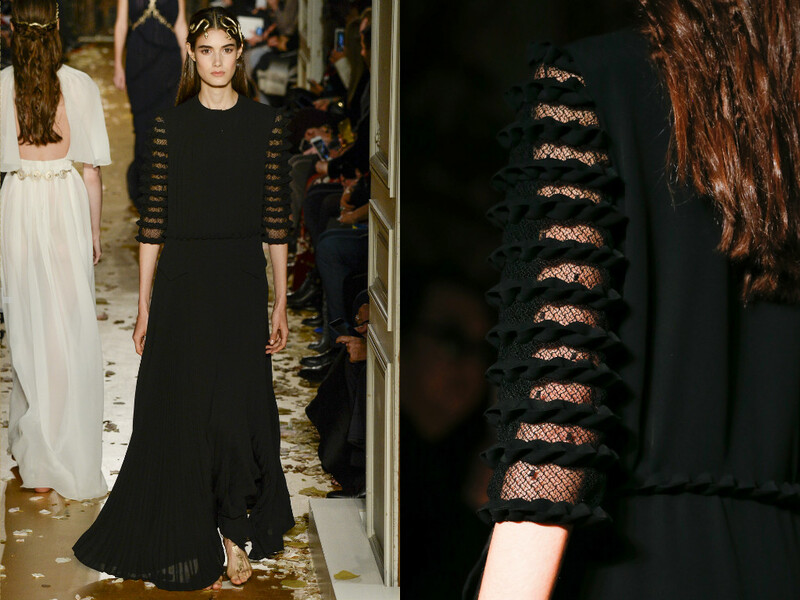 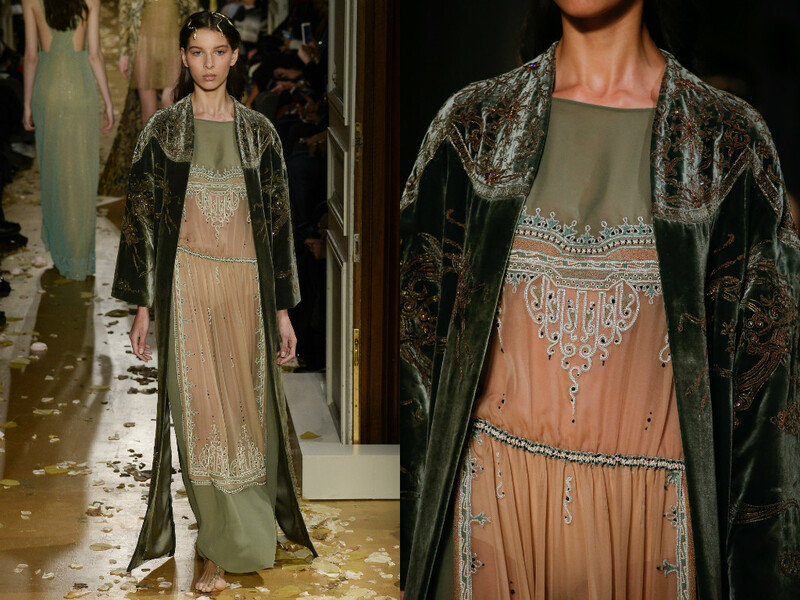 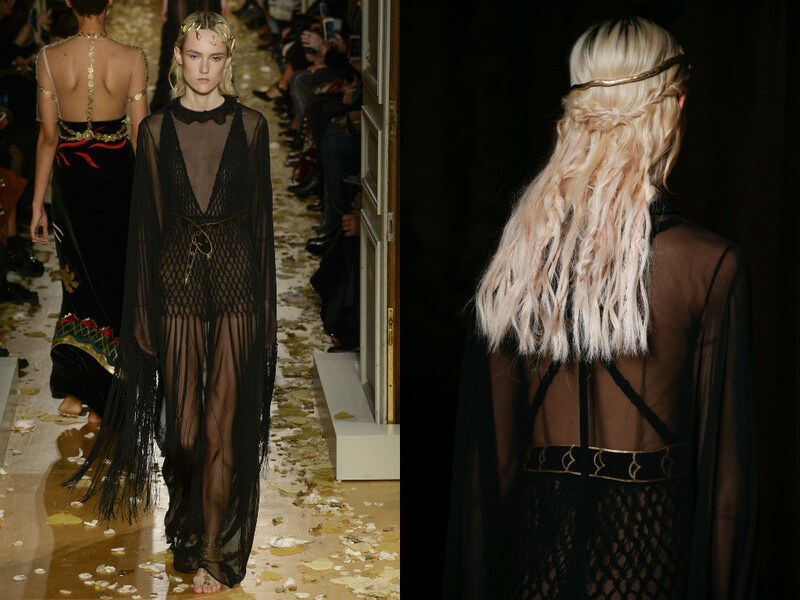 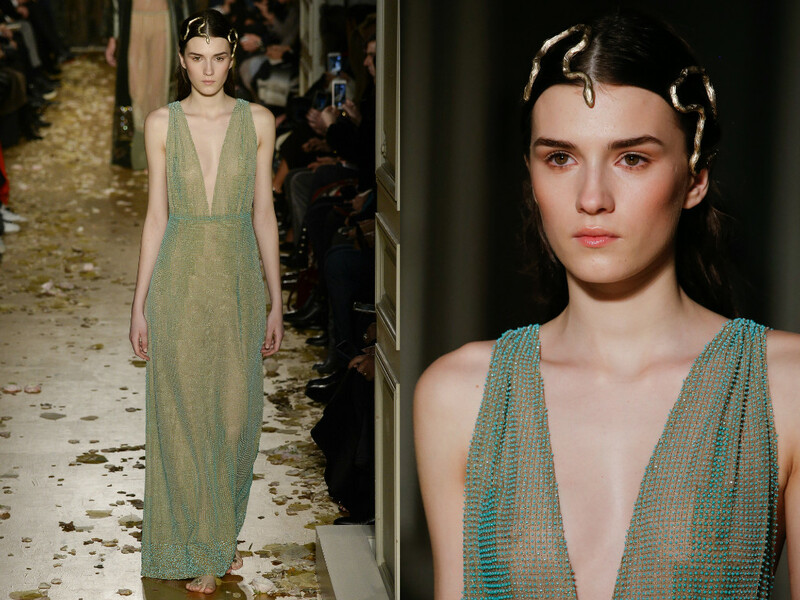 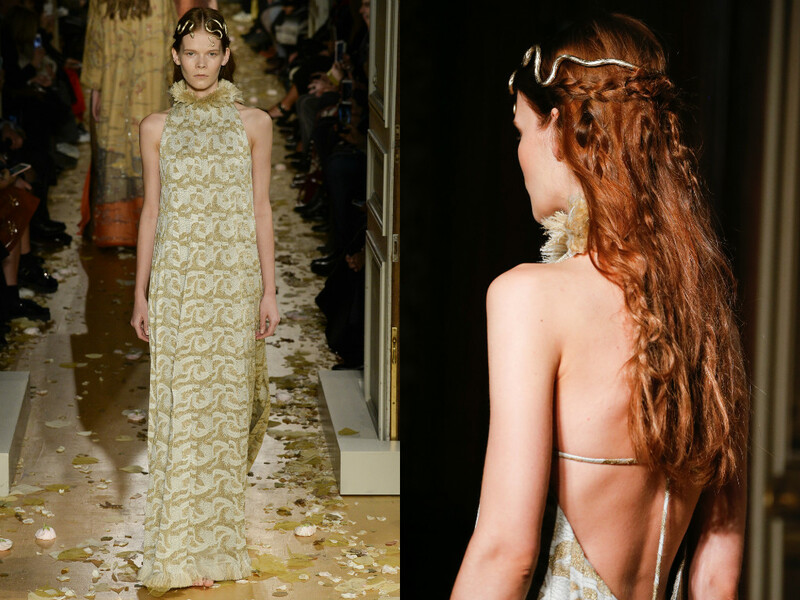 The combination created the perfect Haute Couture collection for Valentino this season. 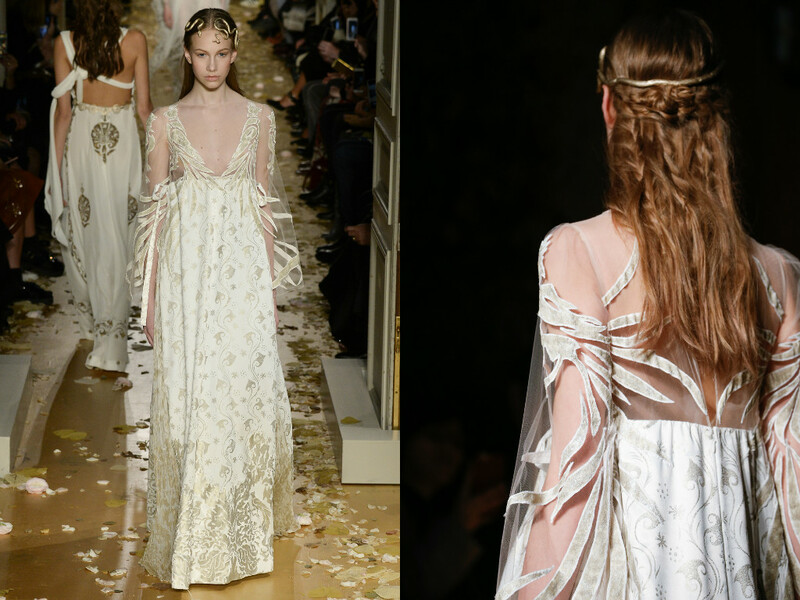 The captivating gowns which were presented to us within this Haute Couture collection was definitely something recognisable from Valentino. 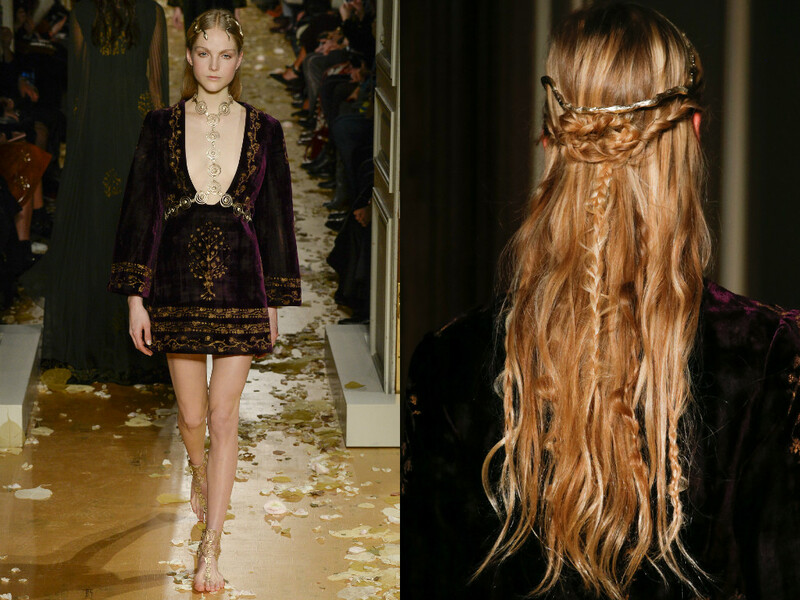 We wouldn't have expected anything less. 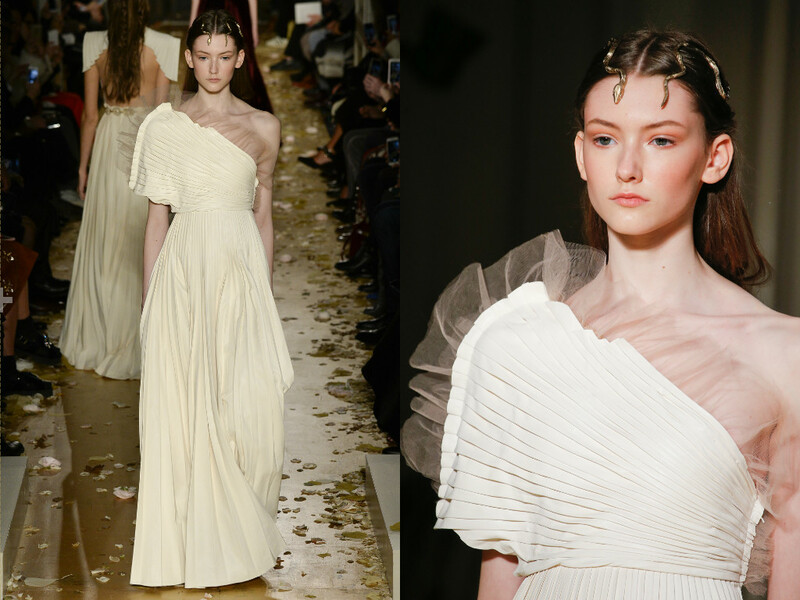 The effortless feel of the collection definitely took a lot of work, the embroidery and creation of the gowns definitely showed us that many hours, seamstresses and hours of design were put into making this Haute Couture collection so fantastic. 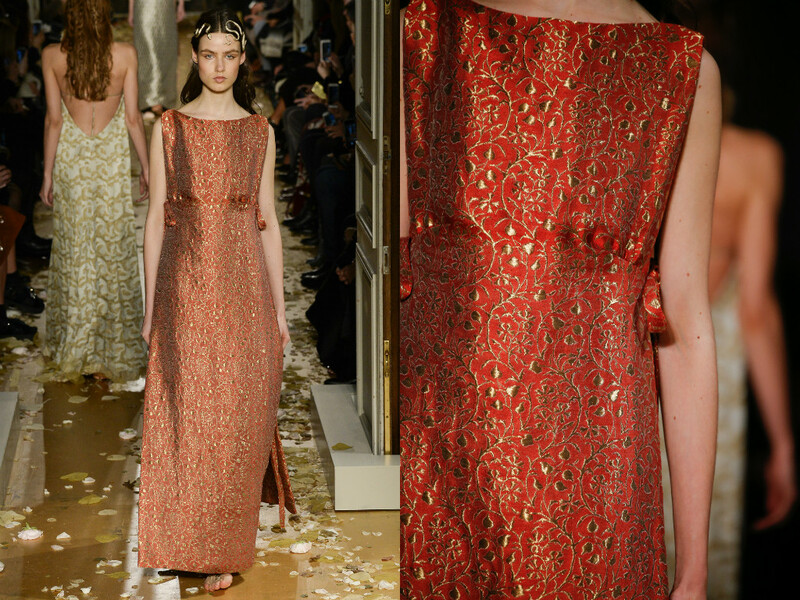 The dresses were of course floor-length, with the exception of some being shorter, which was actually refreshing to see. 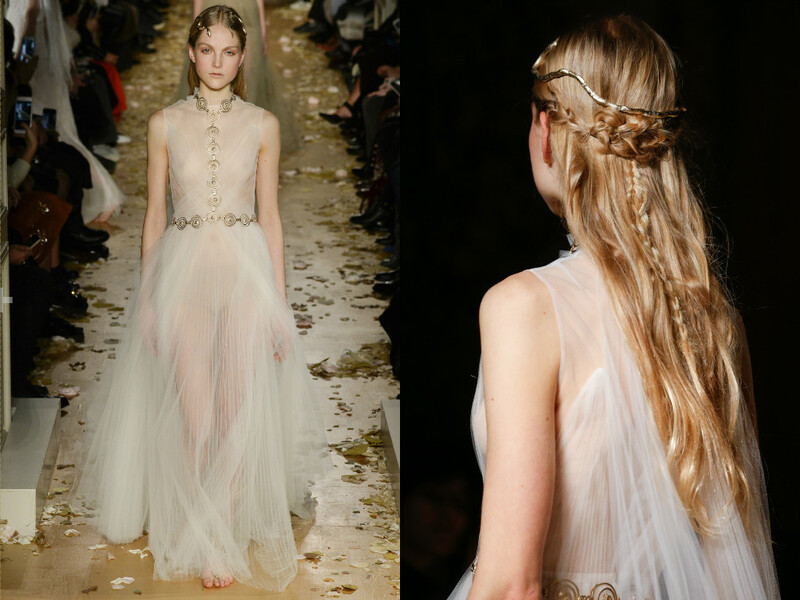 The gorgeous sparkling transparency of the gowns were very innocent, despite the the fact they were see-through and exposing. 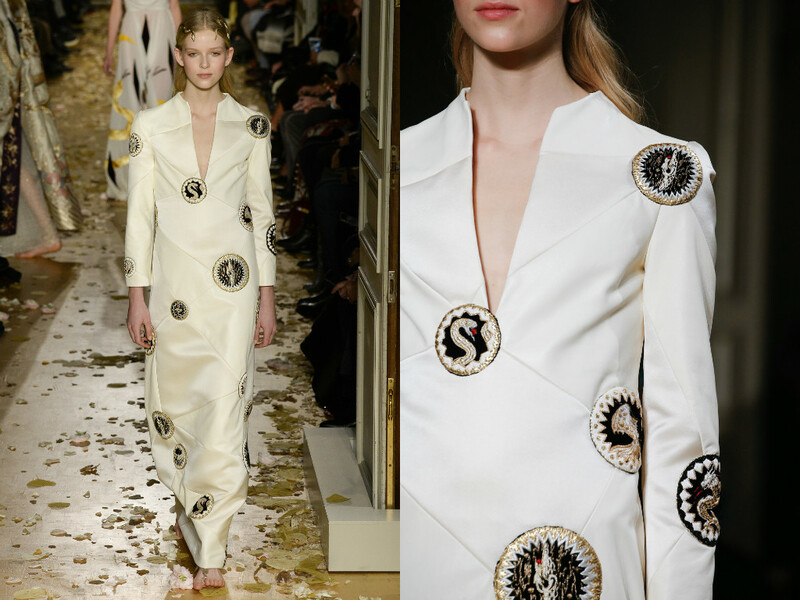 It's very find to get that balance as designers, but Maria and Pierpaolo nailed it this season. 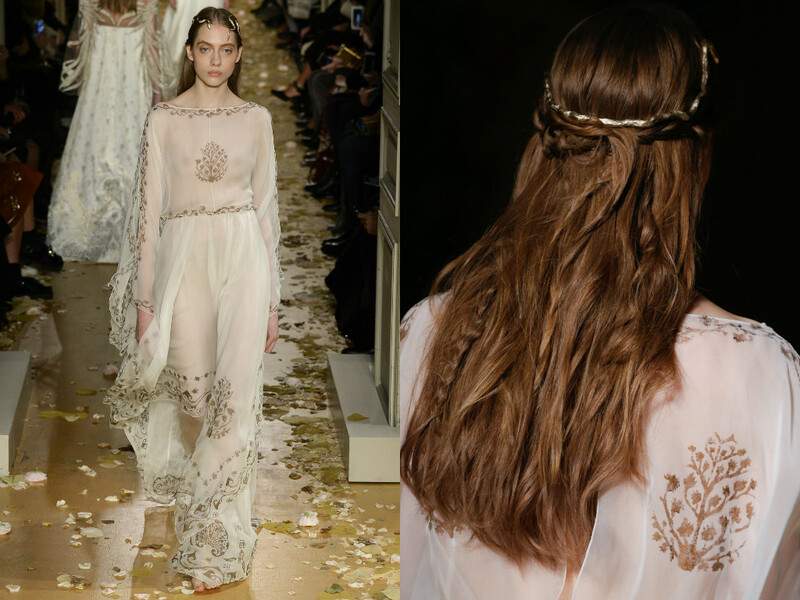 The plunging neck-lines were back, as seen on the Mara sisters at the 2016 SAG Awards, and that is also something that Valentino always keep modest and innocent. 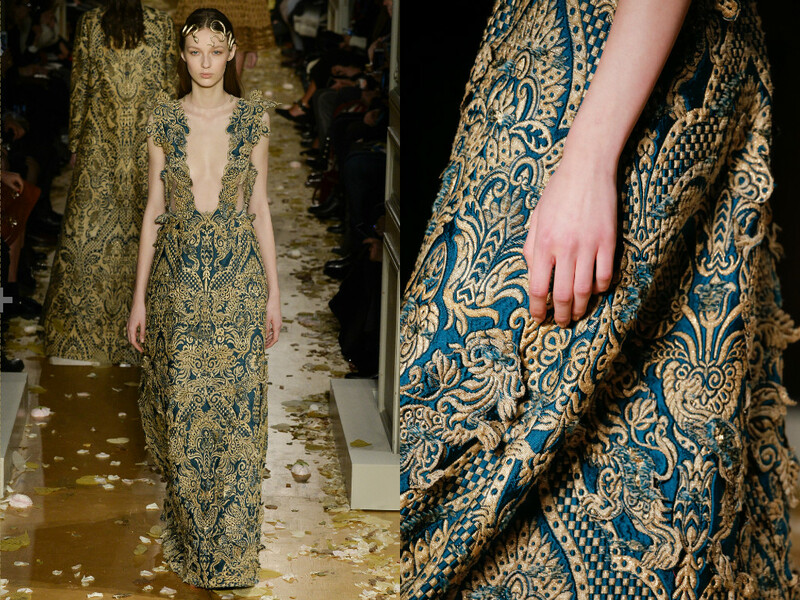 Again, a very difficult aspect to tackle. 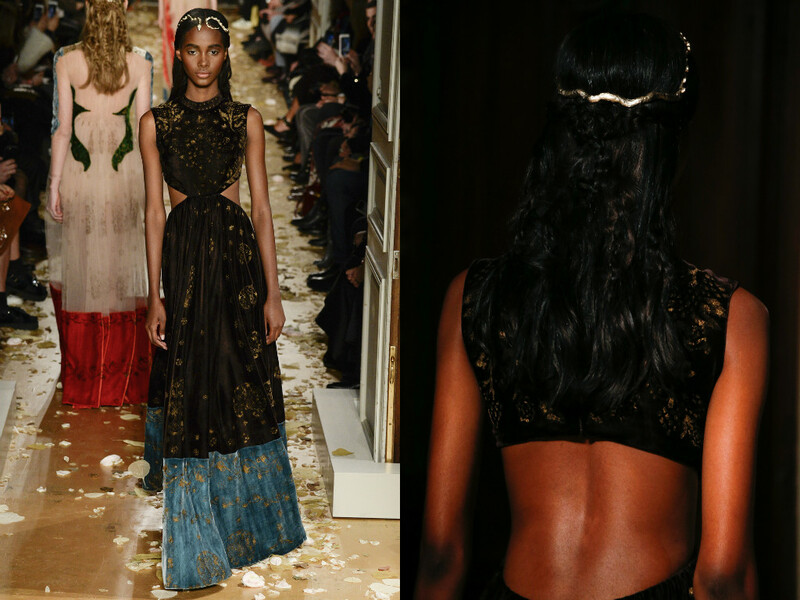 The fabrics that the designers chose is definitely what made the collection what is is. 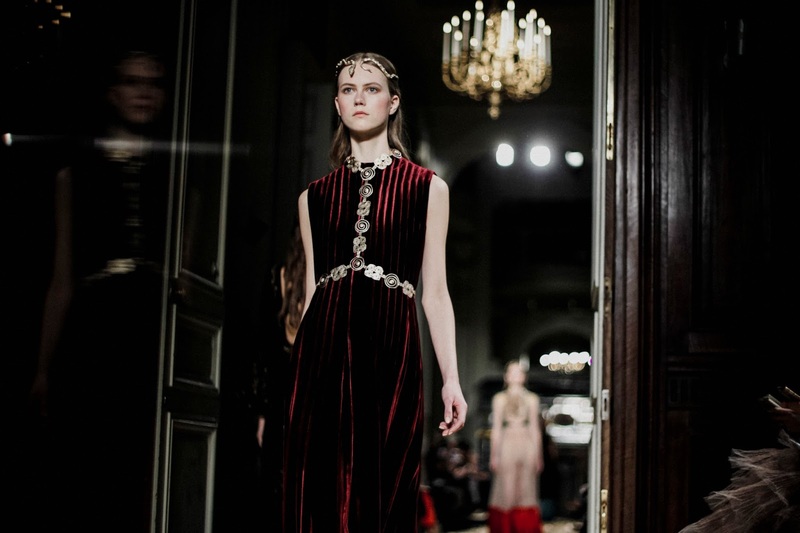 From gorgeous metallic, bold colour numbers to short lengthened, plunging velvet mini dresses. 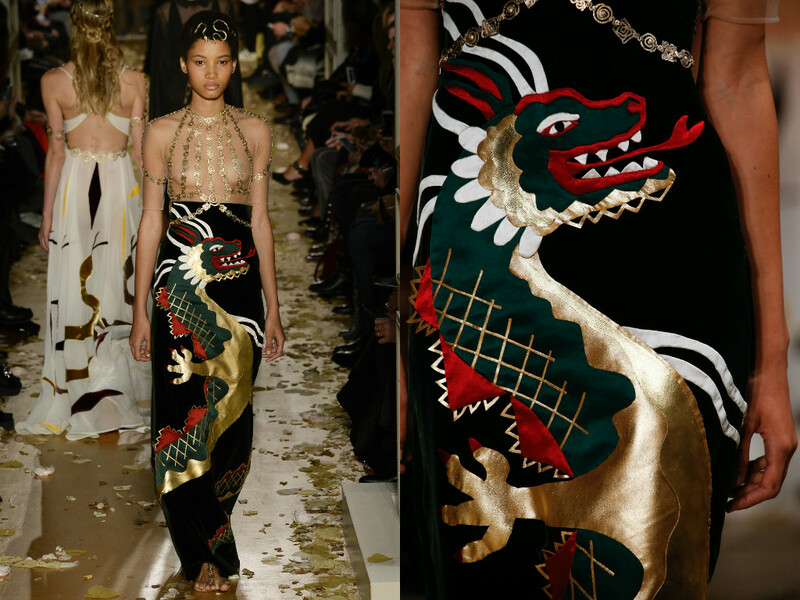 The collection certainly didn't lack diversity, individuality and colour. 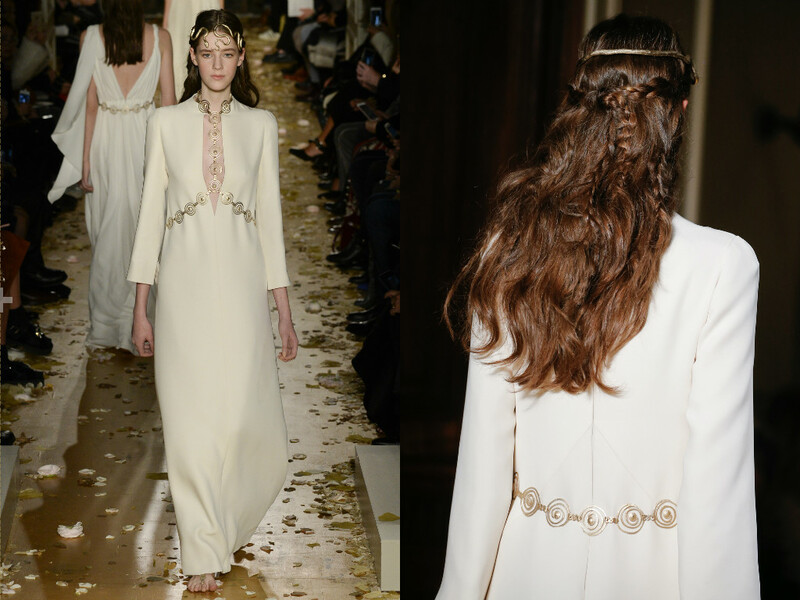 The historic feel of the collection certainly didn't overwhelm the youthful feel that the collection conveyed. 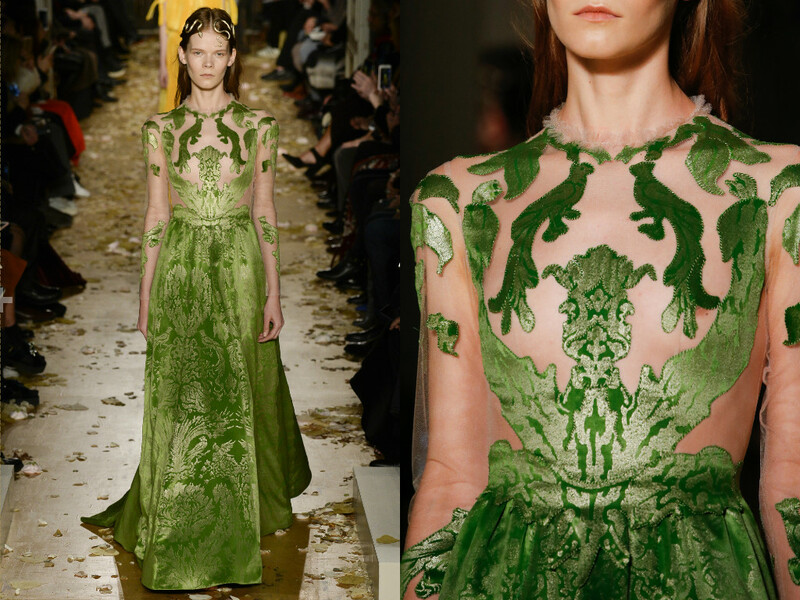 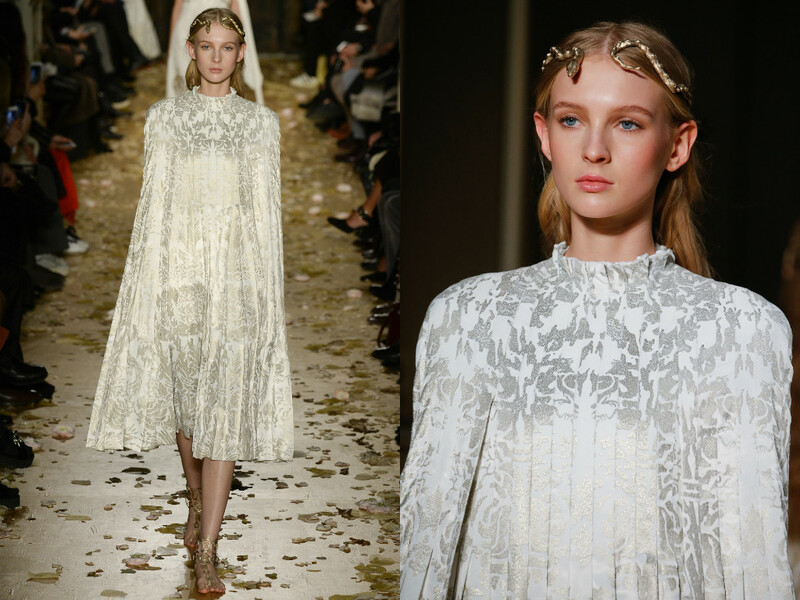 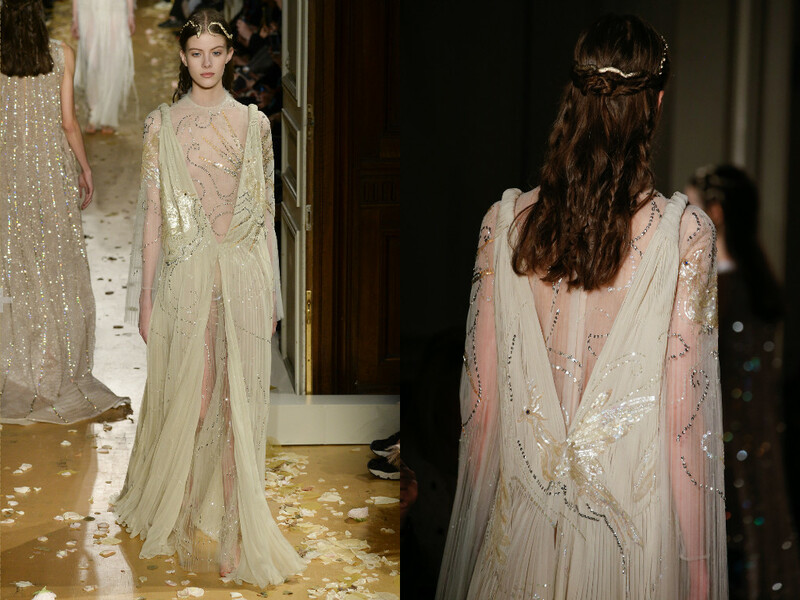 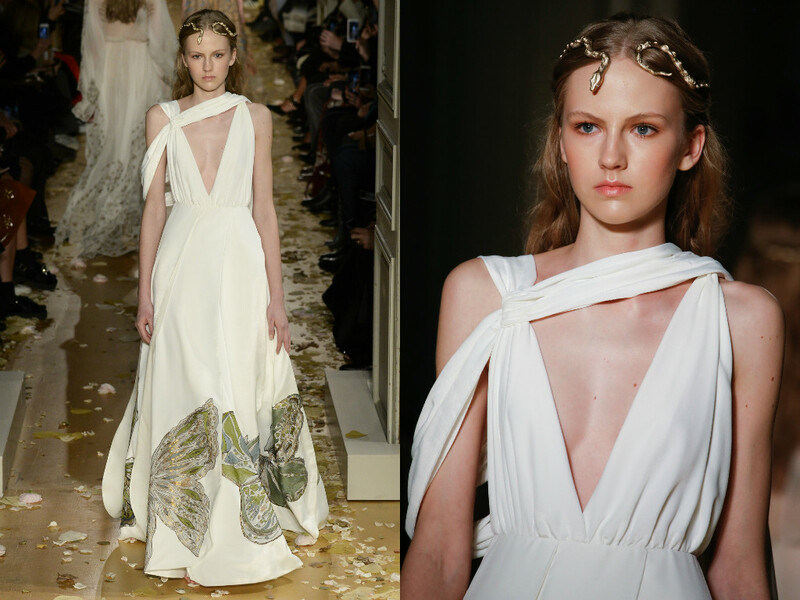 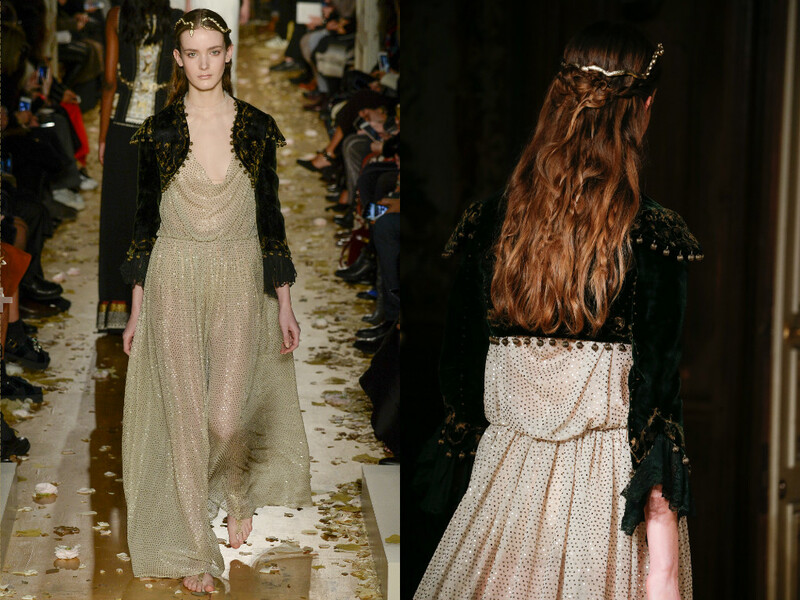 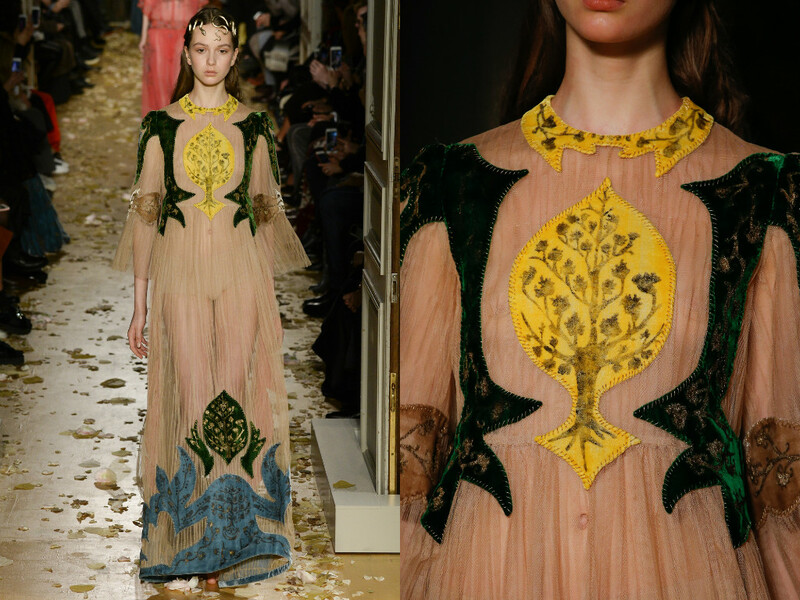 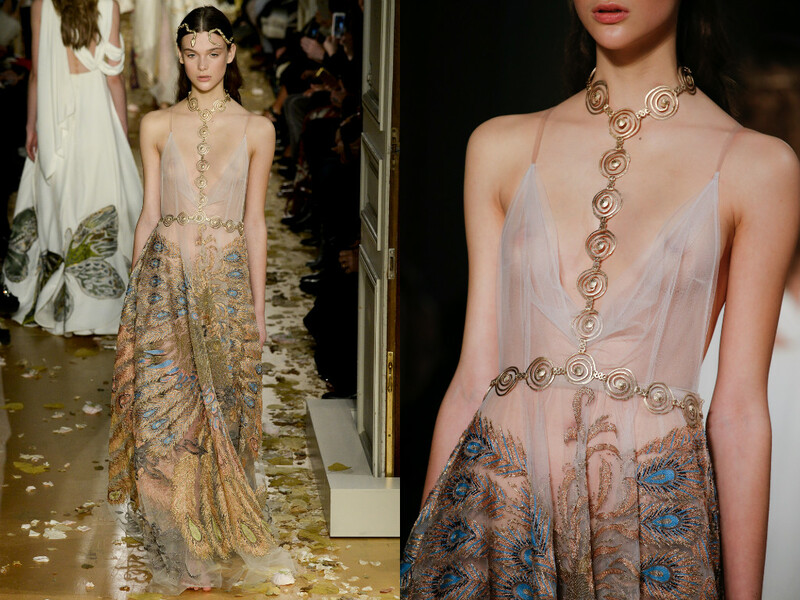 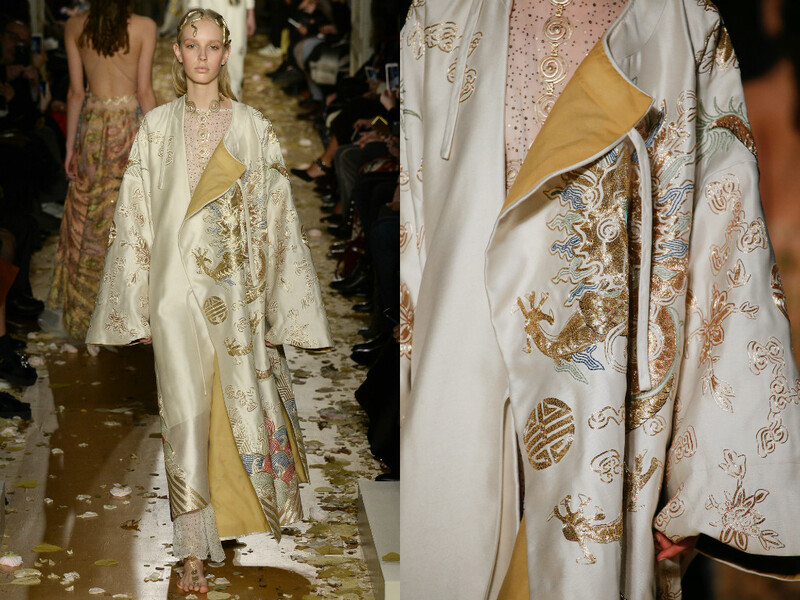 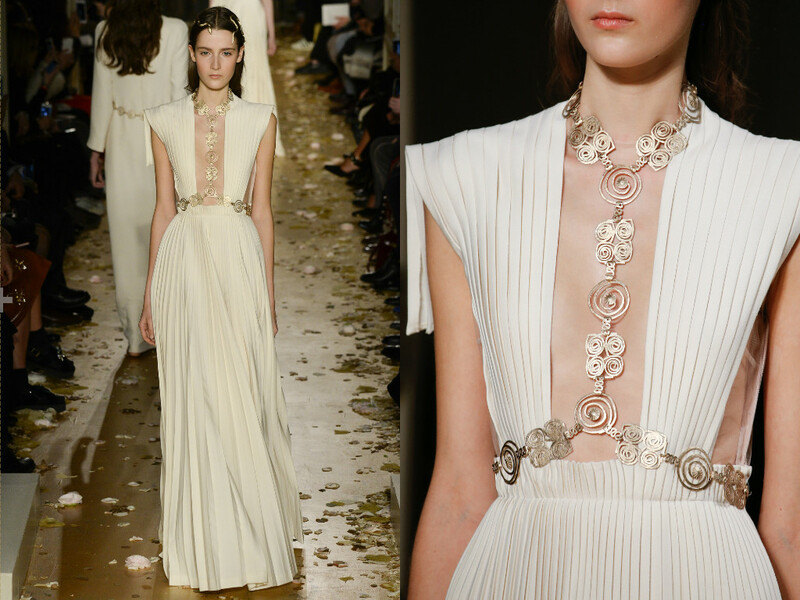 Valentino Couture collections, despite being bold and embroidered to the max, they are always so fresh and romantic. 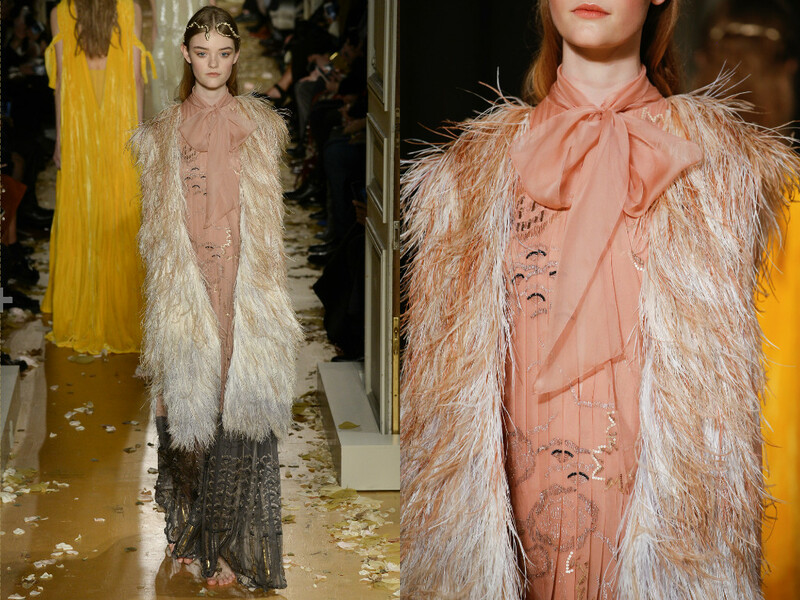 The longer gowns, such as the mink coloured number that opened the show, hung beautifully on the body, which is exceptionally hard for a loose-fitting garment to do. 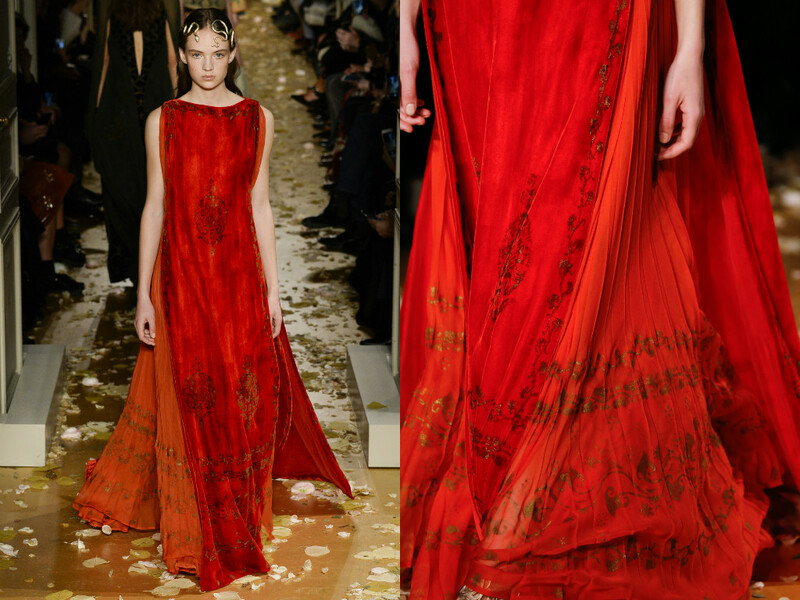 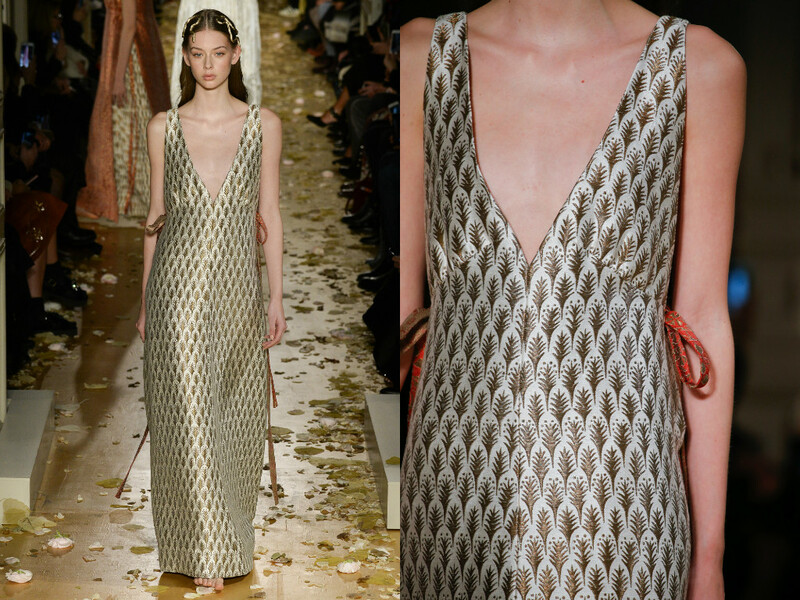 Valentino always execute the structure of the clothes and ensure that they fit the body perfectly. 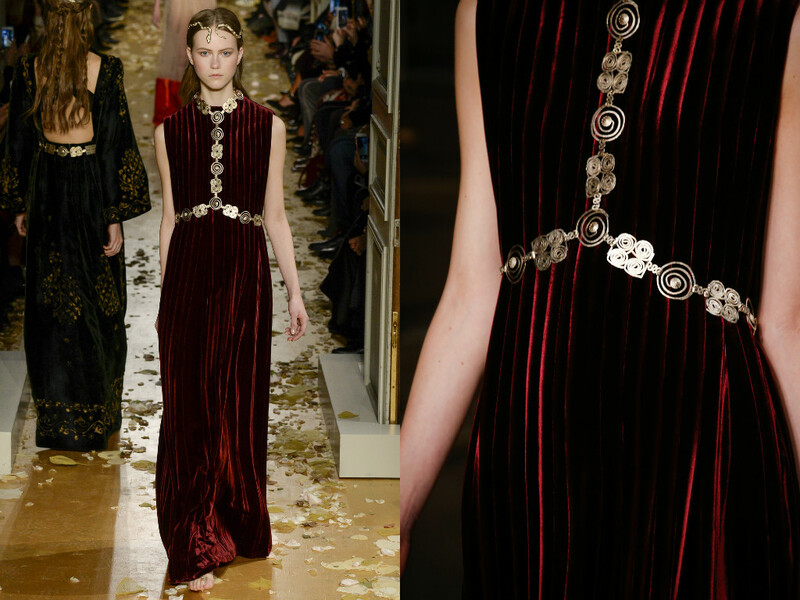 The velvet fabrics were a highlight from Maria and Pierpaolo, coming in the forms of pleated, painted, and even woven. 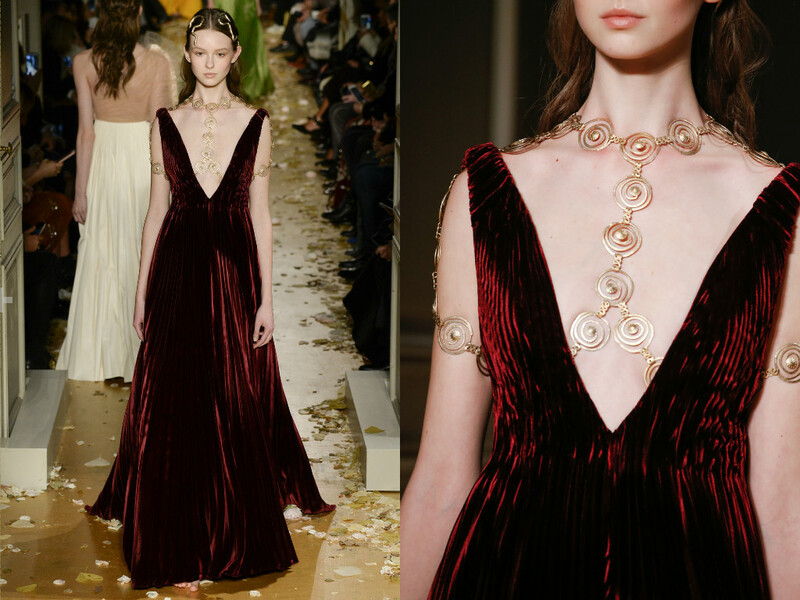 Velvet is such a luxurious fabric in fashion and it certainly contributed to the collection being Couture. 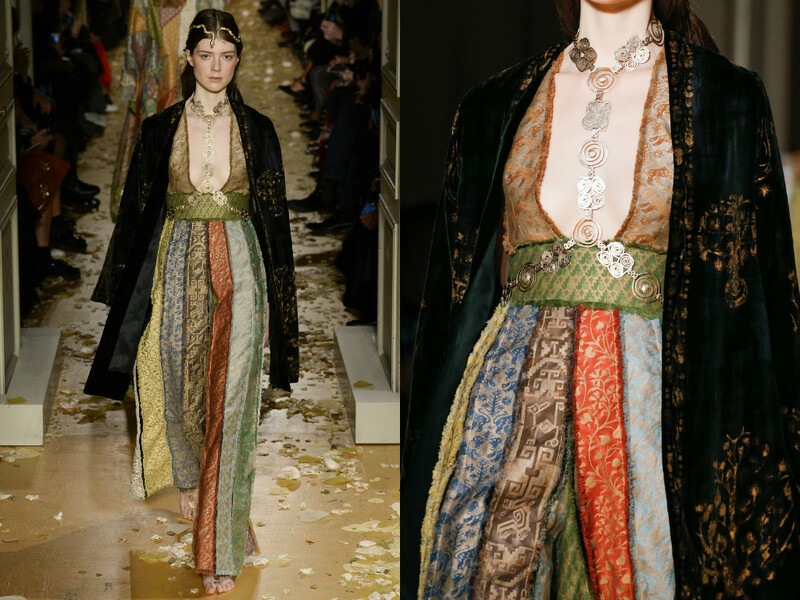 The colours of the velvet was also beautiful, wine burgundies, bold yellows and beetle greens. 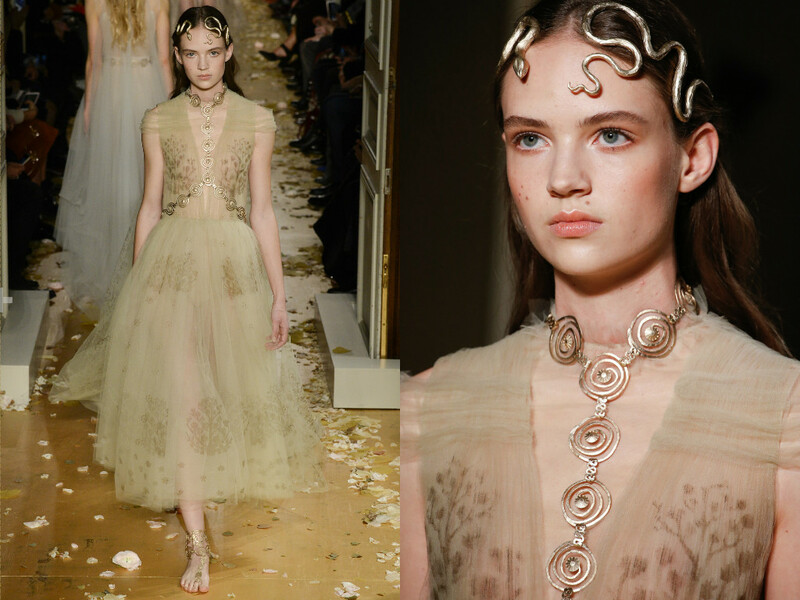 For me, this collection was a Haute Couture success from Valentino.